Along the trans Saharan route, the indigenous Berber tribes of the Mahgreb in Northern Africa, were known for their production of the semi-precious resin know as amber. It was passed down in families as they believed it contained the spirits of those who had gone before. Natural amber resin is one of many materials used in designing my African jewelry. 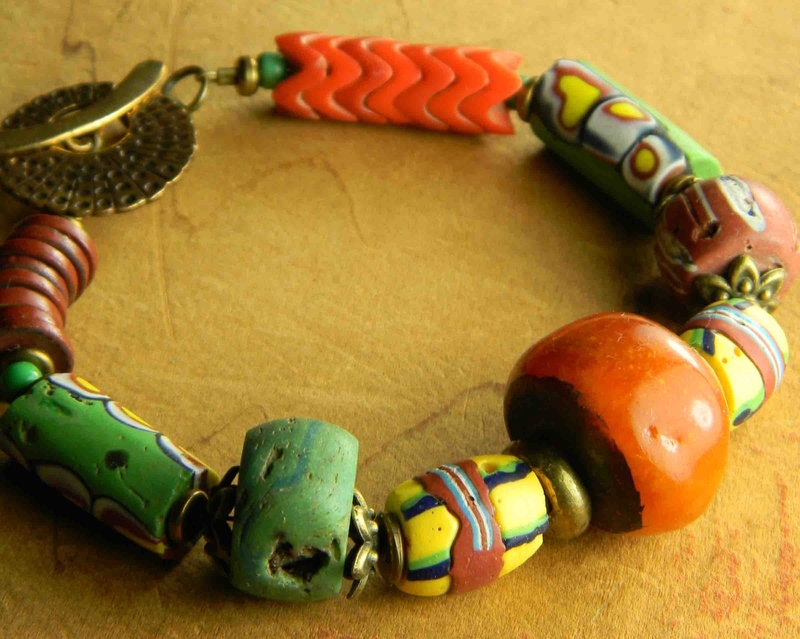 Using a variety of materials is a major factor in making pieces that are interesting, representative of the culture, and have the character of a native designed article of jewelry. Of course, since I am not native African, my designs are strictly my own interpretation of African art jewelry. The above necklace illustrates the combining of different textures and different source materials. 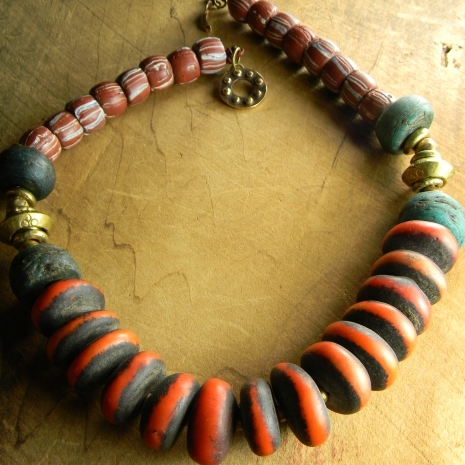 The Moroccan amber beads on the lower portion with brass spacers in between, more brass as a central accent, blue green Hebron spun glass beads from Palestine in the 1900s, and Venetian striped barrels that appear more like ceramic than glass. It is this blend of rich colors and the aged appearance of the beads that is captivating and that spurs my imagination as to the endless possibilities. I find new elements constantly, some are very old and circulated in Africa over 2 or more centuries, some escavated along the Silk Road, and some that are still being made my artisans in Africa and elsewhere, but fit the ethnic character of my work. Again a mix, this bracelet design has our amber focal bead in a very bright and colorful mix, of hand painted vintage Venetian beads with glass snake beads, Prosser heishi beads, and a green Hebron bead. Whenever possible, I try to use authentic African brass components and accents, but occasionally other brass is substituted that is fitting to the arrangement. Usually these brass elements are artisan made, and have that definite tribal aesthetic so important to the composition. As in the bracelet example, the amber need not be the main element of a composition, it serves extremely well as an accent with the color of these deep blue green Hebron beads in the above necklace. One amber accent bead in front, and two metal embellished amber rondelles on either side of the design. You can feel the aged quality, and the history behind these beads. 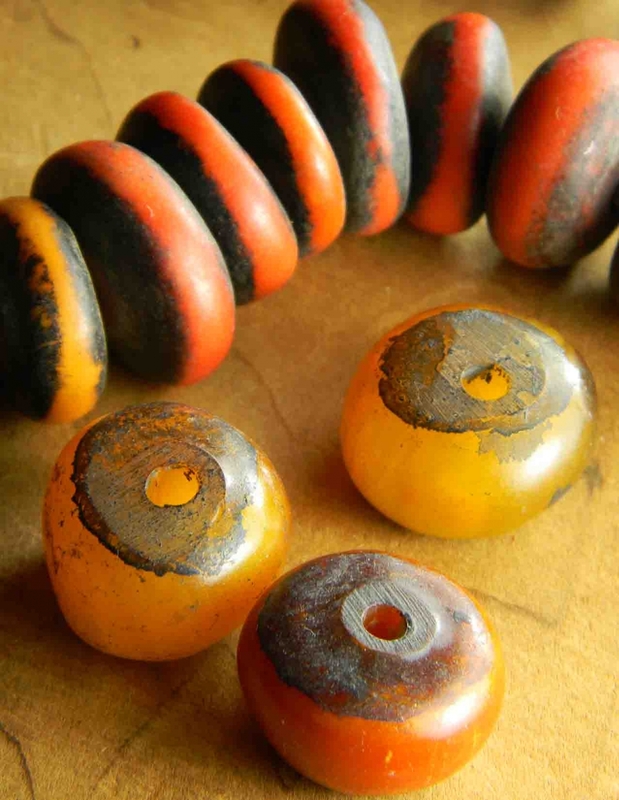 Resin from gum trees taking many years to form into the hardened amber, that is then rolled against a flat wet stone or other primitive tools, giving the beads their shape. As you might imagine, I have aquired a sizeable treasure trove of African beads over the years, and I am always on the quest for more. If you are looking for a piece that is designed just for you, please feel free to contact me with your idea. I have always had this love for this African tribal Jewelry. Their unique shape is what attracted me in the first place. And the wooden beads with some flashy colors make it very interesting too. above all, they are so lightweight. Thank you for your comment, Fred! 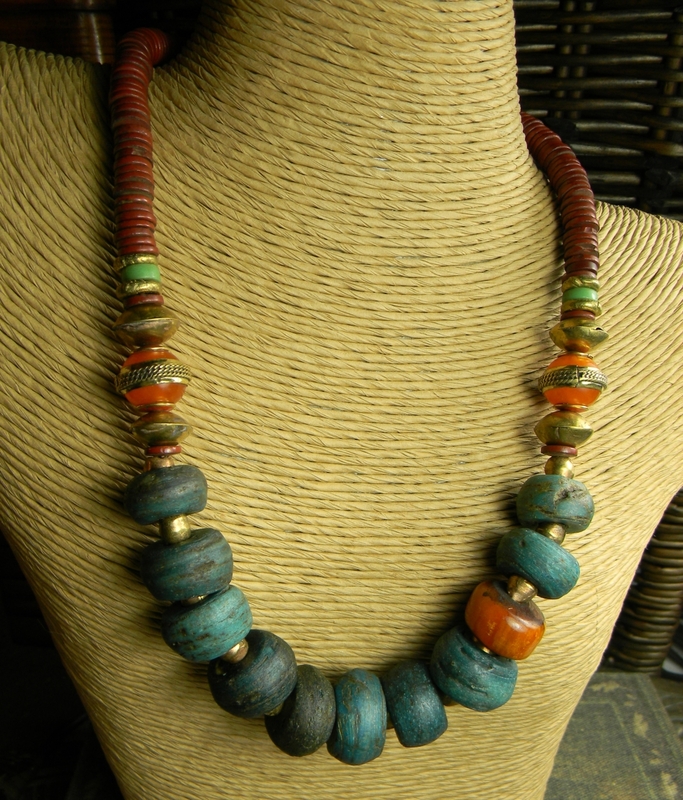 Although some African style necklaces are made with wooden beads, the necklace above is almost entirely glass beads, so it is a little heavier to wear. It also has some amber and lots of brass. It's so much fun to have such a wide choice of materials with which to work when making tribal jewelry.